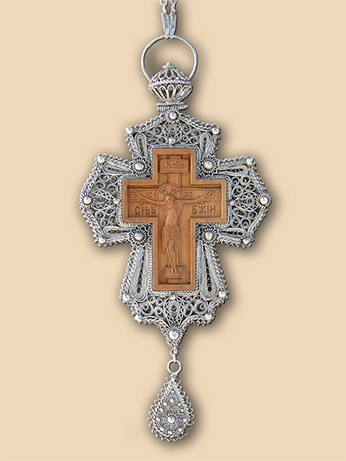 Pectoral cross in silver filigree with hand carved Crucifixion cross in pear wood. Material: silver 950, wild pear wood. Technique: filigree, granulation, miniature carving (Antonijevic Zoran, Raska). 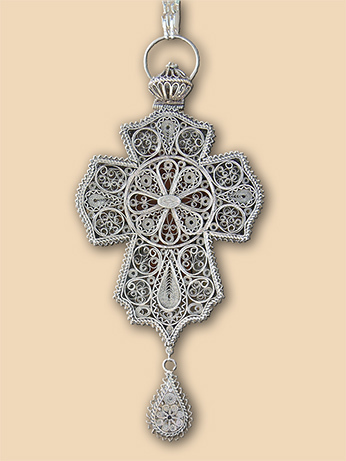 Size: cross 7 cm×9 (15) cm., chain 120 cm. Weight: cross 70 grams, chain 35 grams. Commissioned by: Father Nikolai, Crna Reka Monastery.